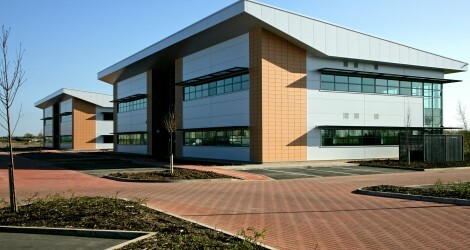 Europarc is the flagship Business Park of North East Lincolnshire. It is home to some of the Region’s leading businesses, with over 2000 employed on site. The Business Park has over 725,000 sqft of business space and has been designed to attract manufacturing, distribution and office based businesses at all stages of their development in high quality, cost-effective, purpose-built accommodation within attractive landscaped grounds. Greater Grimsby is centrally located on the east coast of England in the county of Lincolnshire and includes the towns of Grimsby, Immingham and Cleethorpes. Being just 200 miles from London, Edinburgh and Rotterdam, means Greater Grimsby is central to the UK and mainland Europe and is an integral part of the Humber region and enjoys close links with the nearby city of Hull. Greater Grimsby also has un-congested roads connecting all parts of the UK putting 40 million consumers within a 4-hour drive. This area is the busiest in the country for rail freight and with an airport just minutes away, connectivity is a major attraction. Humberside Airport has flights to more then 30 destinations. Europarc currently has a variety of development delivery options available from Wykeland. With over 47 acres of full infrastructure land available for development, small to medium sized versatile business units at Pegasus Square and Peyton Park, Serviced accommodation at the Innovation Centre and Prestigious Grade A offices on Genesis Office Park. With an impressive and diverse list of successful occupants, many already extending their initial accommodation at Europarc in Grimsby, the flexible cost-effective approach offered by developers Wykeland Properties is undoubtedly a winning one. Over 47 acres of fully serviced development land available. Genesis Office Park provides impressive accommodation built to the highest standards and in attractive, landscaped grounds. The offices boast raised access floors, combined heating, cooling and ventilation systems, quality security systems and ample car parking. All of the buildings are currently occupied. Located at the front entrance to Europarc and adjacent to the A180 interchange, the Village is a 6.5 acre site with outline planning consent for a variety of business support uses including a hotel, restaurant/café, retail, gym, nursery and additional office space. The first development on the Village site is a Farmhouse Inn (Greene King plc brand) which opened in October 2014 and is already trading exceptionally well, underlining the latest demand for high quality services on this high profile business park and road-side location. An attractive development of business starter units built to the highest of standards, set within a beautiful landscaped environment. All of the units benefit from personal access, ample parking to the front and full height loading doors on to a secure gated yard to the rear. Located on Innovation Way and next to the Europarc Innovation Centre, the development includes single story industrial units from 1,529 sqft and a two-story office with suites from 1143 sqft. The Humber Seafood Institute supports seafood, agriculture and food logistics companies, enabling research for cutting edge frozen food technologies. It provides modern, high standard office accommodation, meeting rooms, product development kitchens, refrigeration research facilities, chemical and environmental laboratory equipment, process hall and microbiological laboratories. Located on Europarc near the A180, the serviced reception, restaurant, impressive conference and meeting room facilities provide a welcoming and professional environment. For further information please contact them direct on 01472 324501. The Europarc Innovation Centre provides high standard office accommodation and a range of business support services to new, fledging and innovative businesses. Comprising of a serviced reception, and impressive conference and meeting room facilities, the Innovation Centre provides a corporate image vital to first impressions from visitors and potential clients. Currently available are 54 offices ranging from 215 sqft to 915 sqft with prices starting from £360 per month. Offices are available on a flexible, and easy to understand tenancy agreement. For further information please contact them direct on 01472 324620.